Obama said he would introduce “a federal cap and trade system to reduce America’s emissions of carbon dioxide to their 1990 levels by 2020 and reduce them an additional 80 percent by 2050.” He said his administration would “invest” $15 billion a year in solar power, wind power, biofuels, nuclear power and clean coal to “save the planet” by creating 5 million new “green jobs”. According to a report from the World Meteorological Organization last month, the first half of 2008 was the coolest for at least five years, adding that it may actually be the coolest since 2000. Meanwhile, Arctic ice has expanded by 30 per cent since this time last year as respected scientists predict a new mini ice age within 10 years. Continuing the trend, parts of Kenya just experienced unprecedented ice storms after which 4 inch deep hail covered the ground. This is another of these fascinating cases where top Australian politicians seem unable to get the simple facts of rainfall correct. Is this more evidence of a national delusion where rainfall is concerned ? Premier Nathan Rees is quoted in the ABC Online news story copied below that Tamworth had “..been drought-stricken for some time..”. I have just downloaded a series of 7 BoM (Australian Bureau of Meteorology) drought maps for all periods, 3, 6, 9, 12, 18, 24 and 36 months, see below and there is no sign of drought near Tamworth for those periods. It is telling that the article refers says, “While the rain has broken the drought, valuable crops have been destroyed, including one of the best winter grain crops in the region for years.” Nobody has the common sense to ask, how could such a good crop be grown in a drought ? It may well be that the NSW Govt is still paying out drought relief to the Tamworth region years after any drought (maybe pre 36 months ago) has ended. I have been aware for years that the Govt pays out drought relief to areas where actual rain bears no resemblance to that indicated on BoM drought maps, see my 2005 article, “Are Martians growing Australian wheat ?”. Royal Navy logbooks dating to the 17th century might chart a new course from vague assumptions to verifiable reason in the stormy debate over global warming. Mariners’ well-kept records detailing air pressure, wind speed and air and sea temperatures provide a snapshot of previous climate conditions. For a group of British academics and scientists examining historic climate changes, it’s a “treasure trove” of information, they say. In a preliminary study of 6,000 logbooks, questions already are being raised that challenge the conclusions of global warming’s Chicken Littles. For instance, Europe in the 1730s experienced a period of rapid warming — not unlike that of recent years — which clearly wasn’t attributable to man-made influences. In 2005, scientists linked Hurricane Vince, which developed in an area of low sea-surface temperatures, to climate change. Yet the old logbooks detail a similar hurricane in 1842 that followed the same trajectory. Mere coincidence? Are the ship logs conclusive? Perhaps no more so than the claims of global warming alarmists. But it’s data that should be carefully researched. Something we can’t say of the data deceptively manipulated to argue that the debate has ended regarding man’s role in planetary climate change. Al Gore does Oprah – was anybody watching? “Some of the leading scientists are now saying we may have as little as 10 years before we cross a kind of point-of-no-return, beyond which it’s much more difficult to save the habitability of the planet in the future,” Gore says. Yes, but Al you have been saying that for over ten years and we are still here. 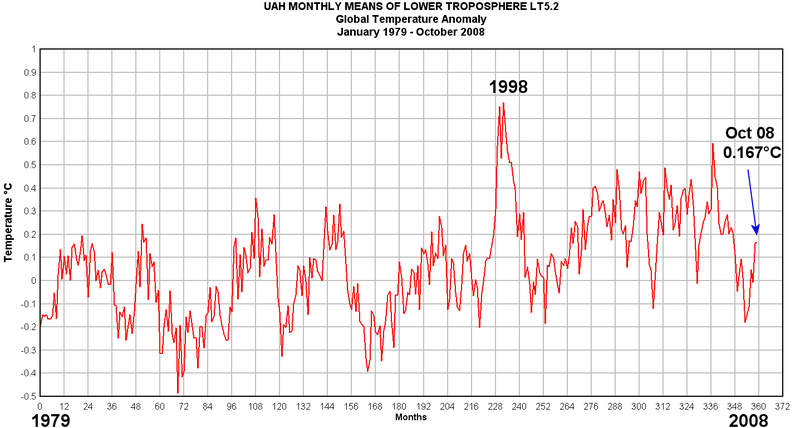 And in the last ten years the global temperatures stopped rising and are now in decline. Gore agrees that the planet’s temperature has indeed experienced up and down cycles, but he says the current up cycle is too extreme. “It’s way off the charts compared to what those natural fluctuations are,” he says. EUROPE is shivering through an extreme cold snap. One of the coldest winters in the US in more than 100 years is toppling meteorological records by the dozen, and the Arctic ice is expanding. Even Australia has been experiencing unseasonable snow. But the stories about global warming have not stopped, not for a second. In May last year, The Sydney Morning Herald breathlessly reported that climate change had reduced the Southern Ocean’s ability to soak up carbon dioxide, claiming that as a result global warming would accelerate even faster than previously thought. The story was picked up and repeated in a number of different journals around the region. But this week the CSIRO suggested the exact opposite. “The new study suggests that Southern Ocean currents, and therefore the Southern Ocean’s ability to soak up carbon dioxide, have not changed in recent decades,” it said. This time the story got no coverage in the SMH, and was run on the ABC’s website as evidence the Southern Ocean was adapting to climate change. CSIRO oceanographer Stuart Rintoul, a co-author of the study, said it did not disprove global warming and he did not believe its lack of an alarmist tone was responsible for the poor coverage. But the story is being pointed out as an example of media bias on global warming. Critics argue that the ABC and the Fairfax media are the worst offenders. ABC board member Keith Windschuttle said yesterday the national broadcaster was in breach of its charter to provide a diversity of views. “The ABC and the Fairfax press rarely provide an opportunity for global warming sceptics to put their view,” Mr Windschuttle said. “The science is not settled. Bob Carter of James Cook University, one of the world’s best-known climate change sceptics, said there was no doubt Windschuttle was correct. “With very few exceptions, press reporters commenting on global warming are either ignorant of the science matters involved, or wilfully determined to propagate warming hysteria because that fits their personal world view, or are under editorial direction to focus the story around the alarmist headline grab — and often all three,” Professor Carter said. National Climate Centre former head William Kininmonth said coverage of global warming had been hysterical and was getting worse, with a large public relations effort inundating the media with information from the alarmist side. I noticed recently a lot of hits to my website coming from Digg. My website has been listed on the Digg website, so head over to Digg and give my website a digg! My website has 69 Diggs so far. As the Czech President, Vaclav Klaus, an economist, anti-totalitarian and climate change sceptic, prepares to take up the rotating presidency of the European Union next year, climate alarmists are doing their best to traduce him.The New York Times opened a profile of Klaus, 67, this week with a quote from a 1980s communist secret agent’s report, claiming he behaves like a “rejected genius”, and asserts there is “palpable fear” he will “embarrass” the EU. But the real fear driving climate alarmists wild is that a more rational approach to the fundamentalist religion of global warming may be in the ascendancy – whether in the parliamentary offices of the world’s largest trading bloc or in the living rooms of Blacktown.